A construction site engineer has a lot on his or her plate, whether it’s working with project planning engineers, making sure safety requirements are being followed, or supervising junior engineers. When we say “communication,” we mean the written and verbal kind. 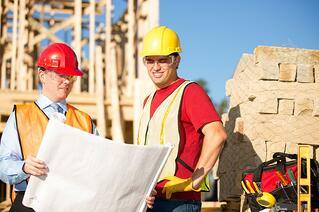 You’ll need to correspond with your staff, the construction manager, subcontractors and other engineers. And you’ll need to be able tell them exactly what needs to happen for each step of the project to move forward. You may also have to give presentations during a meeting to explain the next step of a project or present a larger overview. A site engineer needs to manage a diverse team of professional employees, keep in contact with clients, and make sure their work and the work of others sticks to all applicable regulations and standards. In addition, they need to work within set budgets and time frames. What do these things have in common? They’re all the hallmarks of someone with good management skills. A site engineer needs to be adept in a number of advanced forms of mathematics, including algebra, geometry, statistics and calculus. You’ll need to know how to read blueprints, maps and drawing, and have skill with computer programs used in design and architecture. It’s easy to be creative when the only limit is your imagination. Engineering requires a brand of creativity that can thrive under constraints, whether it’s the wishes of the client or the laws of physics. A site engineer will face any number of obstacles during their work day. Some of them will be easy to overcome. Others will require you to weigh the positives and negatives of possible solutions before picking the best one. In addition to certain skills, site engineers need to know they have the proper tools, and that those tools are working properly. Maxpro can help you make that determination. Since 1993, our calibration lab has been building a reputation as a leader in calibration services in the bolting and torque equipment market. Engineers have a lot to deal with on the job. With Maxpro, you’ll have one less thing on your plate.